A couple of months ago, I spotted a rhododendron while walking along Lower Asian Way in UBC Botanical Garden‘s David C. Lam Asian Garden. The contrast between the upper blue-tinged young leaves and the lower older yellow-hued leaves was striking. When I approached, I saw that it was named Rhododendron cinnabarinum subsp. xanthocodon Concatenans Group. This evergreen species’ foliage has a pleasant aroma that I would describe as spicy or cinnamon-like. Maybe the epithet made me think of cinnamon, and despite seeming like it describes the smell, it actually refers to the cinnabar-red flowers of some of the other subspecies that were first introduced into cultivation from the Himalayas in 1849. Earlier in the year, fleshy yellow flowers adorned this plant. Plants that are attributed to subspecies xanthocodon have lilac to mustard-yellow flowers. Unfortunately though, I didn’t photograph it when it was in bloom. 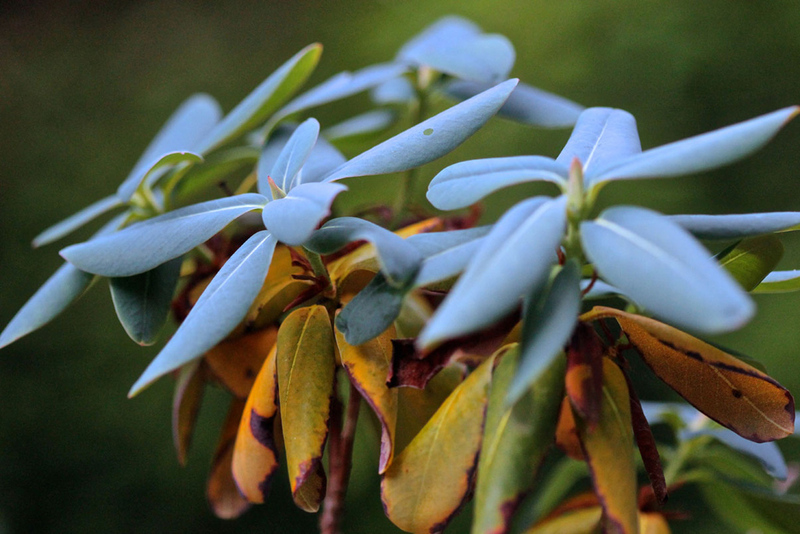 However, you can see what they looked like (and a selection of other Rhododendron taxa we have here at the Garden) in this thread on the UBC Botanical Garden Forums, with photographs taken by Wendy Cutler. Worth noting, as an aside, is that the nectar from this species is reputed to be the most poisonous of the entire genus. Just want to say that I like that your photo especially shows the bluish color of the young leaves. This might not have been possible when it was in bloom.